I can't wait to participate in Canoe Heads 2016 and help send kids to camp! I had a blast leading my team last year and can't wait to do it again. Sign me up! I am interested in leading a team at this year's Canoe Heads for Kids. I can’t wait to help send kids to summer camp by supporting a paddler or team tripping across Toronto’s waterfront. I can’t wait to give more deserving kids the chance to build leadership skills at summer camp. I want to support Canoe Heads for Kids and Amici! Volunteer and help send kids to summer camp! So you want to volunteer at Toronto’s coolest waterfront event? Volunteering with Canoe Heads for Kids is a great way to give back to the camping community and help send more kids to summer camp! Our volunteers give kids the gift of summer camp by contributing their time and skills to this powerful fundraising event. If you are interested in volunteering with us, take a few moments to fill out our volunteer form and send it to volunteers@amicicharity.org. We are seeking energetic, enthusiastic volunteers to help us in the following areas of Amici’s Canoe Heads for Kids. Alongside other Food Team members, you will direct paddlers to food and water stations, along their 15 kilometre portage and paddle down Toronto’s waterfront. Team members work directly with Amici’s food suppliers to acquire, deliver, and organize libations at the Canoe Heads starting line (Harbourfront Canoe and Kayak Centre HCKC), lunch break (Sir Casimir Gzowski Park), and finish line (HCKC). Food Team members have the chance to meet via an organizational meeting leading up to event day to ensure all systems are a go! The Canoe Team directly supports paddlers with the safe handling of canoes on event day, mapping out the canoe staging area, and supporting trailer-to-land-to-water transitions. Canoe Team members have the chance to meet via an organizational meeting leading up to event day to ensure the coast is clear. *Note that crew members of our Canoe team are generally comfortable handling and tripping with canoes. The Canoe Heads Social Media team acts as the eyes and ears of the event for the participants, supporters, sponsors, and followers by posting and promoting creative content on all Amici social media outlets. 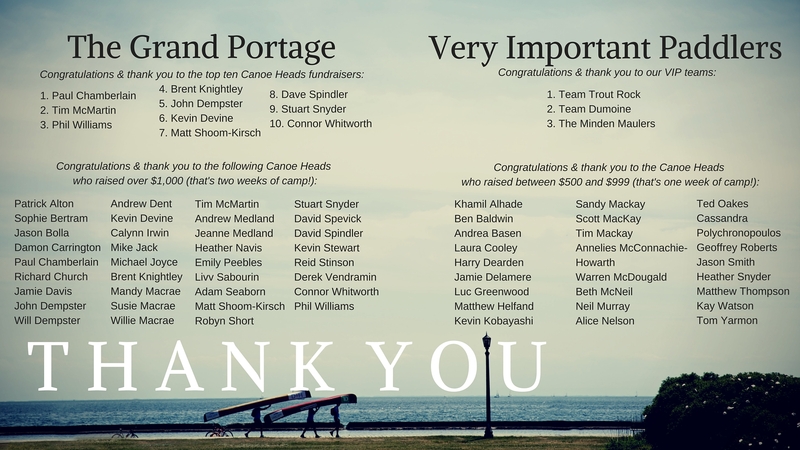 As a member of this team, you are integral to spreading the Canoe Heads love and showing off the amazing work that the Canoe Heads supporters, participants, and volunteers are doing throughout the event! Route Marshals are the cheer leaders of the Canoe Heads event! You will use your energy and enthusiasm to cheer on and guide the participants on their 7.5 km portage across Toronto’s waterfront. Route Marshals answer portager questions and are the point person for emergency situations that occur en-route, ensuring that all teams are accounted for and safe in their expedition. Canoe Team members have the chance to meet via an organizational meeting leading up to event day to ensure the route to success is mapped. The Steering Committee makes significant contributions to the event, meeting monthly in the lead-up to event day, discussing and reporting on developments related to the planning of Canoe Heads. Steering Committee members can choose to work in a subcommittee of either: Volunteers, Food, Social Media, Logistics, Sponsorship, and Individual Fundraising. Members of the Steering Committee commit to 2-3 hours of time every week to planning and supporting subcommittee responsibilities. Your role as a representative of Amici’s Canoe Heads for Kids may have you speaking with potential sponsors, coordinating day-of volunteers, answering emails, voicing your opinion on integral matters to the event, and using the skills that you bring to the group. Unsure of your interests and availability? We can work with you to find your best fit within the Volunteer roles for the event. - Wherever I’m needed the most! Interested in volunteering with us? take a few moments to fill out our volunteer form and send it to volunteers@amicicharity.org. Have questions? Check out our FAQ’s, contact us at volunteers@amicicharity.org or call the Amici office at 416-588-8026. Thank you for your interest! Without the dedication and commitment of our volunteers, Amici’s Canoe Heads for Kids would not be possible.